Hello everyone! My name is Brandon and if you frequent our blog you may remember me writing from Ukraine during our May-June Orphanage Mission Cruise this past summer. I’d like to take a minute and update you on a particular experience and some thoughts that have been churning around in my head since we came home. 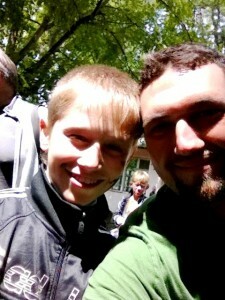 In the very first orphanage we visited, I met a little boy named Ruslan. There’s a photo of the two of us that hangs in my office. During the course of our visit, we gave a gift bag to each child. In the little ziplock bag of gifts that each boy received was a brand new tennis ball. I have never seen such excitement over a little tennis ball, such a seemingly small gift. What was so special about this tennis ball, though, was that it was his. These children don’t get gifts often, and when they get something that is truly theirs, they cherish it. So the first thing we all did was run outside to throw the new tennis balls around. What blew me away about Ruslan—who was obviously athletically inclined—was his willingness and even eagerness to include some of the smaller boys who were standing outside of the little circle that had naturally formed. We were laughing, joking, and having fun… until I made the boneheaded decision to try to show off by throwing the ball behind my back and over my head, and Ruslan’s brand new tennis ball landed in the small garden—in a fresh, wet patch of mud. I couldn’t believe I had just ruined his new gift. He surprised me again, though, when he carefully tip-toed through the garden so as not to get mud on his shoes, retrieved his ball, and held it up with pride—its bright green color tainted and stained—as if everything was fine. He smiled brightly and threw it back in my direction. You see, to Ruslan, an orphaned child with practically nothing to call his own, it wasn’t about the stuff—it was about the love. He didn’t care so much about thewhat as he did the who. That tennis ball didn’t mean something because it was green, it meant something because someone had thought of him. The photo hanging in my office was taken as we were leaving the orphanage—after the mud incident. There is not a trace of disappointment on his face. In fact, there is quite the opposite. I see that photo every day and am reminded to stop trying to protect my stuff, because there’s more to life than stuff. I am reminded daily that no matter who we are, no matter how little we feel we have to offer, no matter how badly we mess up, God wants to use us to bless those in need. If you haven’t been on one of our Orphanage Missions Cruises yet, I want to ask you, without guilt or agenda—why not? You have something to offer these precious children. If you can give a hug, if you can paint a face, if you can throw a ball (even poorly! ), your love can give a child hope—and in that child’s love you might just find some hope as well.